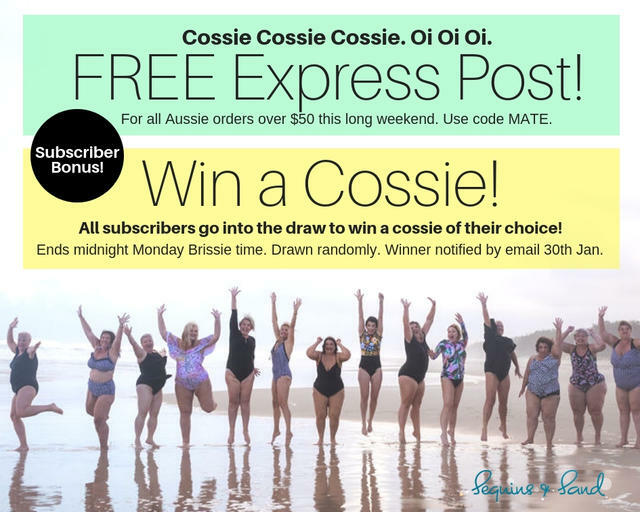 FREE Express Post for orders over $50 + Bonus FREE Aussie Cossie Giveaway . : Sequins and Sand Resort Wear :. Cossie Cossie Cossie. Oi Oi Oi !! I love this wide brown land of ours, it's beauty just keeps on giving, though decent rain to break the drought and bring in the green would be appreciated. We are so lucky to live in relative peace and safety. No shells or gun fire over head. And as for our beaches! The people are bloody awesome too. Girls like you who make up this wonderful S&S community. We are so blessed and grateful. Thank you. So...we thought we'd celebrate with a little treat! For the Australian Day long weekend we are offering FREE Express Post for orders over $50 + as much loved S&S members, a Bonus FREE Aussie Cossie for one lucky subscriber! That winner will be drawn completely at random and notified by email on the 30th January. Fingers crossed it's you! To get your FREE Express Post when you spend $50 or more, use the code MATE at the checkout (for Aussie orders only). However you decide to acknowledge and spend your Australia Day long weekend, we hope it's a bloody good one. And to all who work to keep us safe, a massive thank you.